“Spill in Aisle 12”. We’ve been hearing that phrase over grocery loudspeakers for years. Instead of waiting for human employees to find the hazard, two companies are looking to use a googly-eyed robot as the first line of defense against grocery store spills. Meet Marty the robot from Kentucky-based Badger Technologies. He’s being launched into grocery stores this year in a partnership with food retail group Ahold Delhaize USA. Marty’s job is to patrol grocery store aisles looking for spills and other possible dangers. 8 onboard cameras scan for things like spills and debris. When a hazard is discovered, Marty sends a real-time alert along with images to a control center which then alerts human employees in the store. Not all of the cameras are pointed downwards as some of them scan shelves taking a look at price tags. Marty’s other job is to make sure products are labeled and priced correctly. Like with spills, if the grocery store robot notices any errors he’ll send out an alert. To avoid any customers or shopping carts that may get in the way, laser-based sensors help the slim grey robot navigate around the store. Marty can operate 7 days a week and fully cover a whole store about a dozen times a day. The grocery store robot runs on a rechargeable lithium battery. While Marty’s cartoonish eyes are purely for cosmetic reasons, they do give him a friendlier appearance making customers feel more at ease. 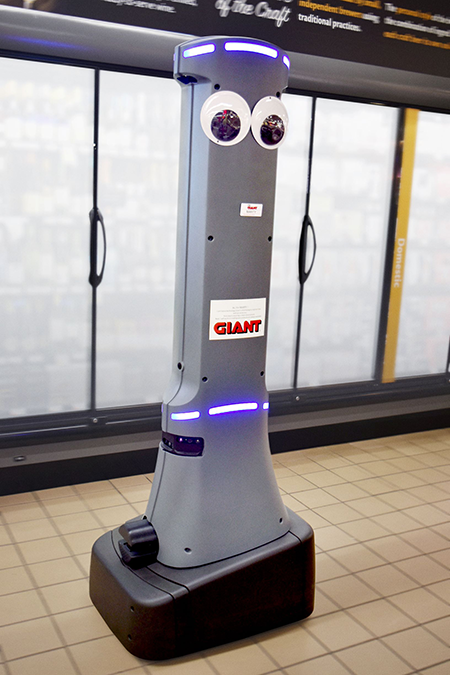 Ahold Delhaize and Badger are placing about 500 of these robots into US grocery stores with the rollout being mostly complete by mid-2019. Some of the chains mentioned in the news release are Stop & Shop, Giant Food Stores and Martin’s. This past year Marty was successfully tested in two stores in Pennsylvania helping to improve efficiency and safety. 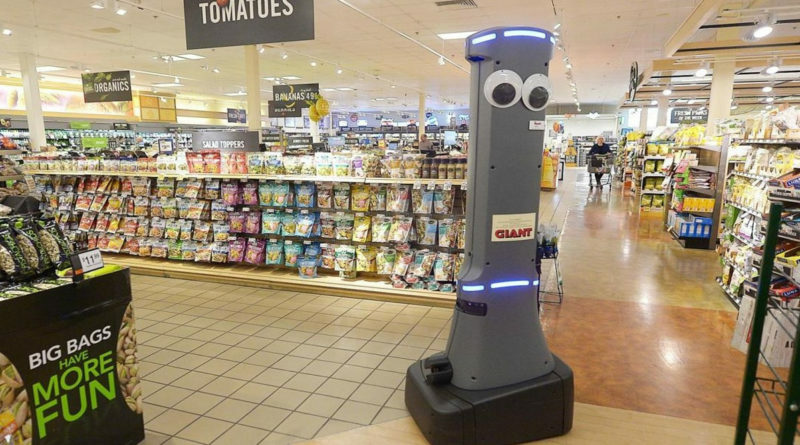 Customers got a kick out of seeing the funny looking robot going up and down the aisles. Check out our articles on robots cleaning up Walmart and drones that protect your home.